The Cape of Good Hope Nature Reserve in South Africa is full of baboons. I can best describe them as unfortunate-looking, aggressive squirrels on steroids. Well, the baby baboons are cute. But baby anything is cute, right? 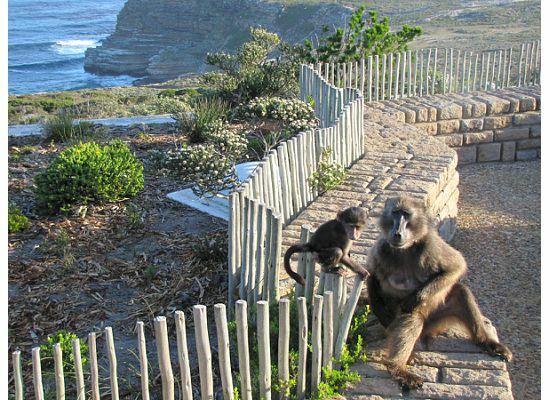 There are signs all over the reserve (and especially at Cape Point itself) warning people not to feed the baboons that live in the park. They can get fairly brazen and steal food from bags, cars, etc., and the park authorities certainly don't want these goofy things learning to expect food from humans. The humans sometimes have the learning to do, though. Despite all the large and obvious signs, a man in the Cape Point parking lot tossed an open bag of chips to the baboon in this picture just moments after I captured this shot. As the baboon ripped into the bag, a park ranger ran over and ripped into the man for, well, being a moron. Don't feed the baboons! But definitely go to Cape Point and watch them. The views aren't too shabby, either.